Delivery £1.95 for this item (Inc. VAT), or FREE if you spend over £20. Each card shows a stunning image from the Anne Stokes art collection. Images include gothic fairy, dragons, angels and vampires. Complete with instruction booklet explaining tarot and what each card means. 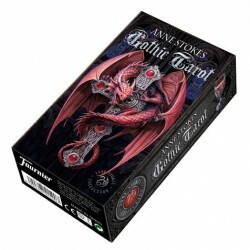 Contains 78 coloured cards and is mostly used for fortune telling, meditation and practice of magical rites. The origin of Tarot is unknown. The cards depict the archetypes found in classical psychology by CG Jung and numerous magical and religious symbols.